The University of North Dakota partnered with design firm Sasaki to craft a “preferred vision” for campus planning over the next 30 years. The plan is only a draft to spark discussion; many elements are subject to change. Image courtesy of Sasaki. Adaptation to state needs has been entwined in the history of the University of North Dakota campus since its founding in 1883. In the 1940s, the campus added more housing for war veterans and their families. In the 1980s, the acquisition of what became the Energy & Environmental Research Center coincided with a boom in oil production in western North Dakota. Recently, in recognition of a growing demand for healthcare professionals, the state legislature funded a new School of Medicine and Health Sciences on the north side of campus. 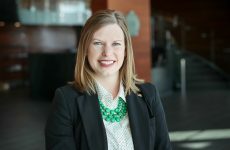 As needs arose, UND answered the call. 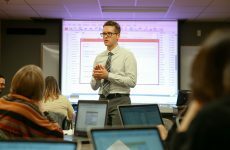 Now, the University is updating its pedagogy and programs to respond to more economic change – and it’s creating a 30-year vision for how the physical campus will support the state and student-serving goals of the One UND Strategic Plan. The cross-sectional team of faculty, staff and students involved in UND’s master planning process has chosen a draft concept that will strengthen the campus core, open up flow to medicine and aerospace districts, and revitalize University Avenue as a central spine of activity. This design concept is only a launching point, a “preferred direction” for long-term planning – many elements are subject to discussion and change. But it sets a framework for short-term strategic decision making on buildings, landscape, roads and more. The foundation of the current master planning process was laid in 2016 with an initial campus master plan, as requested by the State Board of Higher Education (SBHE), focused on space utilization, deferred maintenance, and academic programming. 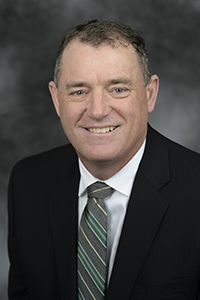 Mike Pieper, associate vice president of facilities, said the SBHE then asked all state institutions to finish their strategic plans, and then use those as a guide to update their master plans for their respective schools. Now, a broader 30-year campus vision is being molded through a partnership with Sasaki, a planning and design firm. Sasaki combined the findings of the 2016 process, priorities of the new UND Strategic Plan, and campus survey results to craft three malleable master planning concepts for the University. The concepts considered UND’s campus design goals of being consistent, compact, cohesive, connected and captivating. Ultimately, UND’s steering group liked elements from all three, and worked with Sasaki to mix and match aspects into a draft campus plan. One heavily favored element was the placement of a proposed STEM building in the campus core, providing updated lab space for research and teaching as desired in the Strategic Plan. The STEM building could be placed in the area of the Hyslop Sports Center (merely an idea at this point in planning), with the Hyslop’s northern entrance and east side to be preserved and renovated. Neighboring Starcher Hall would house additional STEM office and classroom space. Witmer Hall would be taken offline. “The concept builds up that area, with the Hyslop and Cornell Street, and opens up a nice pedestrian flow through the science and engineering buildings into the main quad, connecting the campus very well,” Pieper explained. Additional first-phase plans include items that have initial state approval – a new or renovated home of the College of Business & Public Administration that may incorporate components of Montgomery Hall (plans dependent on final funding), a reutilization of the J. Lloyd Stone House as an engagement center (including enhanced gathering spaces), and updates to the Chester Fritz Library. UND is also seeking approval to refresh and renovate the classrooms of Merrifield Hall and update and expand the Memorial Union. Later, as a part of a mid-phase plans, the tenants of Columbia Hall would move back to the campus core into existing spaces opened up by the use of the STEM building. If a new Nursing building were proposed, land adjacent to the Medical School is assigned. UND is also evaluating some underutilized newer buildings west of 42nd Street for potential administrative/operational support space. The demolition of a number of buildings – including the Northwestern Apartments and other housing units in that area – will cause a net reduction of more than 600,000 square feet of underused space over 30 years, making the campus more compact and efficient and eliminating many deferred maintenance concerns. 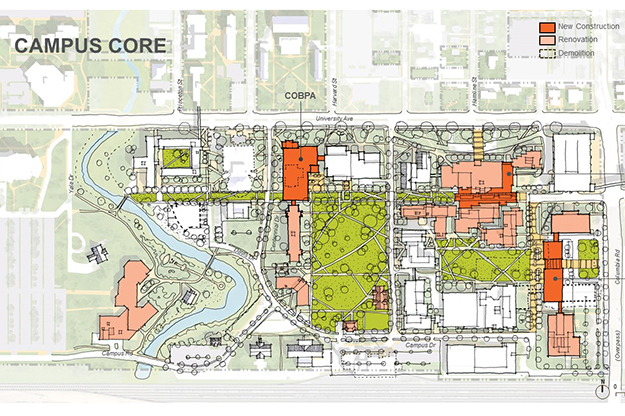 Every design scenario addressed the student need for pedestrian mobility in three main corridors beyond University Avenue – Second Avenue, Hamline Street (running north to the Medical School), and Princeton Street (running north to the Wellness Center). “We want to work on improving the lighting through those areas to make sure students feel safe, and maybe expand the sidewalks or create bike lanes to improve that mobility,” Pieper said. 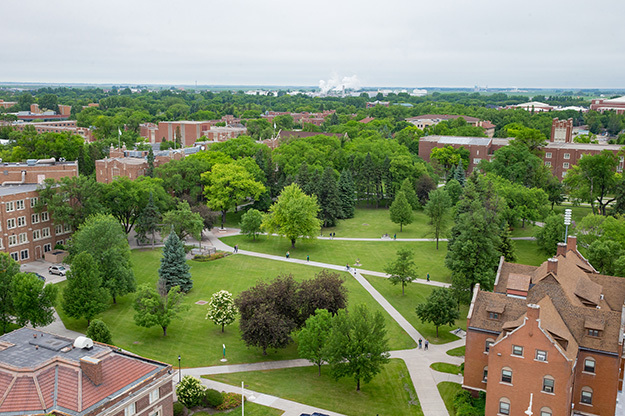 The draft UND Campus Master Plan pays close attention to strengthening the campus core with a proposed STEM building and better pedestrian mobility and safety. UND archival photo. 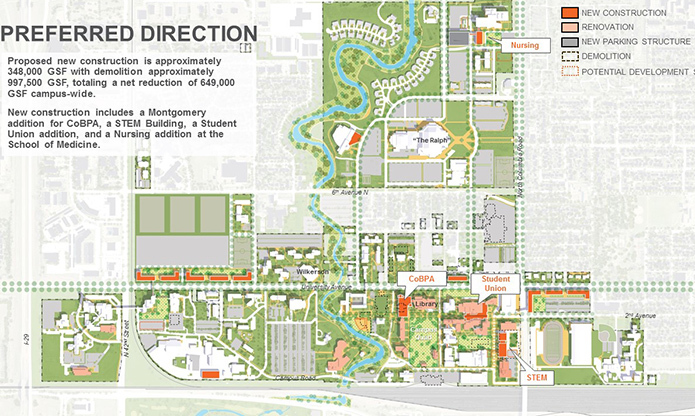 The UND Campus Master Plan also takes into account other planning processes occurring on campus – including within Housing and Athletics – as well as the Coulee to Columbia initiative described in Goal No. 3 of the Strategic Plan. Les Bjore, UND director of planning, design and construction, urges those examining the conceptual master plan to remember that it’s a long-term, flexible vision. 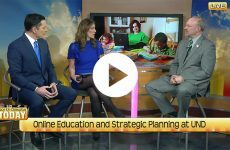 “We still have to work out the individual phases, and how we actually get to that 30-year overall plan. People shouldn’t get too excited about some of these elements quite yet,” he said with a chuckle. The UND Campus Master Plan is not a single committee discussion. UND and Sasaki planners want input from all areas. Facilities will be taking comments at und.facilitiesplanning@und.edu. Sasaki will return later this month to work additional feedback into the plan, which will then be formally submitted to the SBHE in February – the next step in UND’s perpetual adaptation to a changing educational and economic landscape.